Looking for Arcadia tee times that won't tie up your schedule? There's a unique solution sitting close to the San Gabriel Mountains. 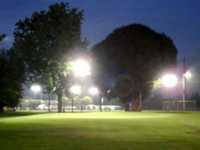 Arcadia Golf Course is an 18-hole, par 3 course with lights illuminating the course and practice area, allowing play to stretch late into the evening. Opened in 1962, Arcadia Par 3 is a 1,947-yard course with a 99 slope and 50.8 rating. Numerous tricky and well-placed bunkers surround the Poa annua and bentgrass greens, requiring strategy and accuracy. Arcadia Par 3 is praised by many as a great place to play cheap golf in Arcadia, while still offering something for everyone. It's a perfect place for beginners to learn the game, but also presents plenty of challenges for the seasoned player. Arcadia Par 3 tee times are flexible thanks to its distinctive lighting, which also allows players extra time to work on their games. The practice facilities include a putting green and a driving range that is open from 6 a.m. to 10 p.m. The Golf Learning Center offers instruction for junior golfers while adult players can take advantage of Arcadia's PGA-certified "Get Golf Ready" program. Arcadia Golf Course is a perfect place to plan a tournament. The course pro shop includes and club rentals and a snack bar is available to satisfy any players appetite.